Flat-headed dung beetles Pachylomerus femoralis with a ball of the good stuff, photographed by Guido Coza. The dung beetles of the Scarabaeini include 146 species found in Africa and Asia, classified by Forgie et al. (2006) into three genera: Pachysoma, Pachylomerus and Scarabaeus, with the last including the vast majority of species. The Scarabaeus species are perhaps the most famous of all dung beetles, renowned since ancient history when Egyptians saw a dung beetle rolling a ball of dung along the ground as a metaphor for the movement of the sun through the heavens*. Dung beetles collect their turd balls to use as food for themselves or for their larvae. 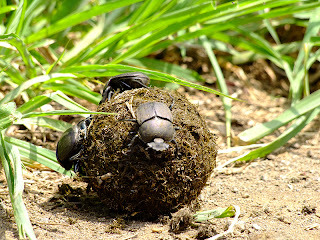 Ball-rolling is not unique to the Scarabaeini as a method of transporting dung, however (it is also done by members of other dung beetle tribes), nor do all Scarabaeini species engage in ball-rolling. *It probably does not say much for the standard of ancient Egyptian public sanitation that they were apparently so willing to believe that the ultimate source of all life on the planet was a giant mass of burning poop. Flightless orange dung beetle Pachysoma denticolle, photographed by Alex Dreyer. 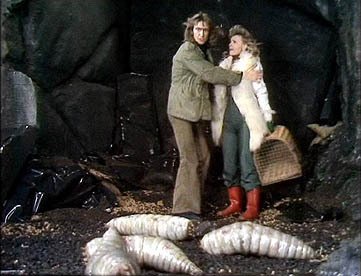 The flightless dung beetles of the genus Pachysoma, for instance, transport their food by dragging it along between their hind legs. Pachysoma species are also less choosy than other Scarabaeini, feeding not just on dung but all manner of organic detritus. They have specialisations allowing them to feed on drier food particles than other Scarabaeini, suitable for their arid habitats in southern Africa. 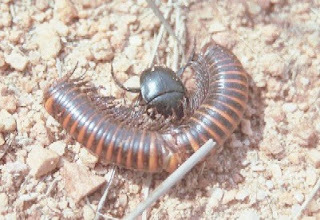 In contrast, species of the subgenus Sceliages within Scarabaeus are the epicures of the scarabaein world: they feed entirely on dead millipedes, which they push along in front of themselves bulldozer-style (Forgie et al. 2005). Relatively few species of Scarabaeini feed by burrowing directly alongside piles of dung where they lay, but this may be done by Pachylomerus and Scarabaeus galenus (both of which may also transport food). Individual of Sceliages transporting a millipede, photographed by Shaun Forgie. 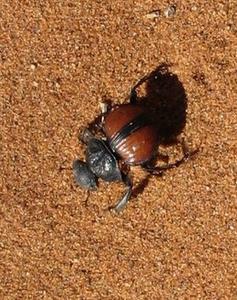 Most Scarabaeini are active during the day, but a small number such as Scarabaeus satyrus are nocturnal in habit. 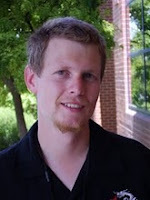 In the phylogenetic analyses conducted by Forgie et al. (2005), these nocturnal species usually formed a single clade. Had the ancient Egyptians observed the nocturnal dung beetles as well, they could have presented us with a sky full of poo at all hours. Forgie, S. A., U. Kryger, P. Bloomer & C. H. Scholtz. 2006. Evolutionary relationships among the Scarabaeini (Coleoptera: Scarabaeidae) based on combined molecular and morphological data. Molecular Phylogenetics and Evolution 40: 662-678. Forgie, S. A., T. K. Philips & C. H. Scholtz. 2005. Evolution of the Scarabaeini (Scarabaeidae: Scarabaeinae). Systematic Entomology 30: 60-96.
" ... sky full of poo ..."! Phrase of the day! I hadn't heard the Egyptian symbolism before. Very interesting.